But before you buy this nice looking portable turntable, read this review in its entirety because its cuteness and cool look may fool you. After all, this beautiful piece of decoration is also a record player and you will be using it to listen to your beloved vinyl collection. I’ve seen many people buying this product as a gift for their loved ones. It makes sense because of its price, size and beautiful design. I think it can be a nice present for pretty much anybody, but in my opinion, kids and teenagers will best appreciate it because the world of vinyl is new to them. They have never heard an LP before and they aren’t too picky about the sound quality. This product could be a great kids record player. If you really need a portable record player and you are on a low budget, this may be a good choice for you. 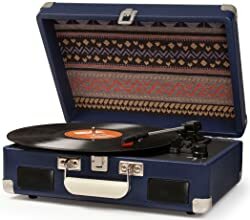 This suitcase record player is a good option for a dorm or a small room as it does not take lots of space and can easily be stored or displayed on a small area. This product is also good for someone wanting a little first experience with vinyl but don’t want to spend a lot of money. Be aware that you won’t be able to experience the so called “vinyl superior sound” with this particular player. This is a fantastic player for introducing children and teens to vinyl, but don’t expect to get a great sound out of this unit. At least not from the built in speakers. I recommend the Crosley CR8005A to somebody that doesn’t really care about sound quality and wants a very easy to use player. Someone that just wants to plug-and-play without messing up with external speakers, cords or a complicated setup. The Crosley Cruiser may be good for you, if you like an old lesser quality sound. Great product if what you want is a nice decorative piece regardless of the sound quality. If you have an old vinyl collection that isn’t in mint condition or if you have some cheap records that you don’t mind wearing out, then you may consider this player. On the other hand, if you have a fine collection with some expensive 180 and 200 gram records or old weird LPs in good condition that you can’t find anywhere, you would be better off investing on a good quality turntable. This product is definitely not recommended for serious vinyl collectors or high fidelity enthusiasts. You may be very disappointed with the sound quality of this unit. If you care about the condition and long life of your vinyl records, I recommend investing on better quality equipment. If you are looking for a turntable to transfer your music to a digital medium, this player wouldn’t be a good choice because you wouldn’t get a very good quality. If after this short introduction you think that the Crosley Cruiser may be right for you, keep on reading, you’ll find very useful information. If you need something a little better, you may consider the Crosley Collegiate. If portability isn’t a must for you, take a look at the Audio-Technica AT-LP60 USB which is one of my favorite low budget turntables. You can also read some of my other reviews. 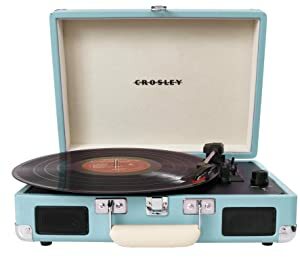 The Crosley Cruiser, like other portable and affordable turntables, has a ceramic cartridge, also known as piezoelectric pickup or crystal cartridge. The piezoelectric effect refers to the ability of certain materials to produce electricity when a bending or deforming force is applied to them. The ceramic rod inside the cartridge generates an electrical signal in response to the bending forces induced by the stylus. The voltage generated by the ceramic material is large enough that there is no need to use a preamplifier. Ceramic cartridges also attenuate high frequencies and boost low frequencies, which eliminates the need for an equalizer. Not having to install a preamplifier and an equalizer enables manufacturers to greatly reduce the costs of production. One of the advantages of ceramic cartridges is that external noises entering the system through the stylus are less important. This is very convenient for light units like this portable player. Generally heavy turntables are better at isolating internal and external vibrations. But the Cruiser is designed to be light and portable. Therefore, its light design makes it vibrate more, especially when using the built-in speakers. Ceramic cartridges are more prone to skipping with music with strong bass and drums. Skipping may also happen when the turntable resonates with the internal speakers during loud music passages. Attached to the cartridge is a diamond tipped stylus. I’m assuming the tip to have a radius of 0.7 Mil (0.0007 in). I couldn’t find information on the tip radius. The manufacturer didn’t include this information on the specifications. Other brands selling needle replacements for the Cruiser specify a tip radius of 0.7 Mil. According to Crosley’s website, the needle will last approximately 1000 hours. In my opinion, it would last about 300 hours because of the tracking force on this player. If you are going to play records often, I recommend buying an extra needle. The required needle for the Crosley Cruiser is the NP6. You can buy the NP6 needle directly form the manufacturer’s website, LP Gear, amazon or ebay. The cantilever is the long part of the stylus. 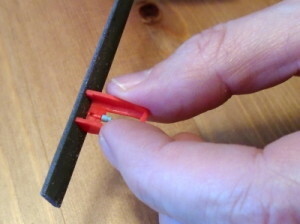 One end attaches to the ceramic rod of the cartridge. The other end has the diamond tip. The needle that comes with the unit has a cantilever made of ABS plastic. 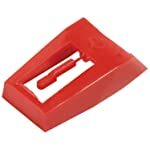 This type of plastic is very resistant, similar to the plastic used for Lego blocks. A stylus with a metal cantilever may improve the performance of your player. Someone has reported that changing the stylus that came with the unit with the metal cantilever one solve their skipping problems. Be warned that the manufacturer advice is to only use the NP6 replacement. The needle that this unit takes is a NP6. That’s the only needle capable of playing any records on this unit. Even the 78 RPM. So, there you have it. You can use the same needle to play your 78 records and only the NP6 would work on this unit according to the manufacturer. It’s true that a 0.7 Mil stylus would be able to play a 78 RPM record, but it’s not optimal. A 78 rpm vinyl record has wider groves than 33⅓ and 45 rpm records. Long play records have microgrooves and require a stylus with a tip whose radius is approximately 0.7 Mil (0.0007 in). Long play records are stereophonic. It means that you have left and right channels on the same groove, with each wall containing one channel. On the other hand, a 78 record is monophonic (it has only one channel of music), and because the grooves are wider, it requires a needle with a tip radius of about 3 Mil. What happens when you play a 78 rpm record using a normal 0.7 Mil stylus? You will hear more surface noise (hiss) than if you played it with a 3 Mil needle. Also, the stylus will wear out faster when playing 78 rpm records. I bought two replacement needles to find out if they actually worked on my Crosley Cruiser. I bought a 0.7 Mil needle with metal cantilever (793-D7M) and a 3 Mil needle for playing 78 rpm records (793-S3). I got both of them from eBay. Both were manufactured by Pfanatiehl as you can see from the pictures. To my surprise, the replacement needles didn’t fit! They looked the same size as the original, but once I installed them, they would pop out of the cartridge. I carefully filed the back side of the needle, but very lightly. Both needles fit perfectly now. The metal cantilever one, sounds better than the original with plastic cantilever. However, I tested the 3 Mil needle with an old 78 rpm record and it produced a lot of surface noise. I will test the 3 Mil needle again with a different record and report my findings. For the moment, I don’t recommend buying replacement needles made by Pfanatiehl for this particular turntable, unless you are willing to spend some time fixing the needle. I’m also going to test the replacement needles (0.7 Mil and 3.0 Mil) from LP Gear. I will report my findings. Here is a video that shows you how to change the needle on any Crosley turntable. Follow the instructions for the NP1 needle. The same instructions apply to the NP6, they just have not updated their video. As you may know by know, this unit does not have adjustment features like counterweight, anti-skate or tonearm height. Which is expected from a low end turntable. This record player has an auto stop feature. When the needle gets to the end of the record, the platter stops spinning. It doesn’t have an automatic arm return so you have to manually return the arm to its rest. The auto stop feature can be enabled or disabled using the auto stop control switch. The arm doesn’t get all the way to the spindle. This may be a problem with some vinyl records that may have grooves close the center of the record, which is not very common. Some 78 rpm records have grooves close to the center. Some unusual records have grooves hidden beneath the center label called under label grooves. If you have one of those beautiful records, the Crosley Cruiser may not be able to play the hidden tracks. One very important thing to consider is that the tracking force of the tonearm is to high. Measurements of more than 5 grams have been reported. A heavy tracking weight may help the needle stay inside the groove and avoid skipping, but at the cost of wearing out your vinyl records and the needle faster. The Crosley Cruiser CR8005A is a belt driven turntable. If you’re planning to use this player often, you may need to replace the belt in the future. Replacing the belt is not complicated. Crosley provides an easy to follow video that shows you how to replace the belt. You can find the replacement belt at LP Gear. Most of the parts of the turntable mechanism, including the platter, are made of plastic. 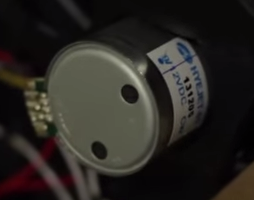 It has a small DC motor. And some of the parts on the inside are hot-glued. No information of wow and flutter is provided by the manufacturer. The motor is not very powerful and the speed is not very accurate, but this is something to be expected from a low budget portable turntable. It does not have a speed adjustment control which would be very useful in this case. This player does not have reverse playback, but I wouldn’t worry about this feature, unless you wanted to hear some hidden messages from old records. It has a rubber slip mat that goes on top of the platter. The rubber mat has a diameter of 6¾ in and sits on a 7¾ in diameter base. Some times the slip mat does not sit on the platter completely flat. This may cause the music to sound warped, like speeding up and slowing down causing periodic pitch variations. The platter has three small rubber bumps that make the surface of the slip mat uneven. You may be able to fix this issue by placing small self adhesive rubber bumpers on top of the platter to level-out the mat. 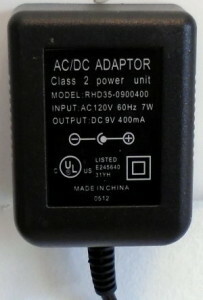 This product comes with a 110V AC power adapter with a 9V 0.4A output. If you live in a country where 220V is the norm, you may need to get a power transformer for 220V. However, I don’t advice to do this because, even if you can get the right voltage, the current frequency may have an effect on the speed of rotation of the platter. One design flaw is that the power cord cannot be stored inside the unit. This means that you would have to carry both the power cord and the turntable separately during transportation. Many people have asked if this unit runs on batteries. This particular model (CR8005A) doesn’t run on batteries. But the Crosley Cruiser II (CR8005C) is a battery powered record player that came out recently. It uses 6 AA batteries and also includes an AC power adapter. It’s a little more expensive though. The Crosley CR8005A has two built in 3W stereo speakers. They are located on the front to the sides of the handle. The speakers are small and as one may expect, the sound is not too loud. The internal speakers are very convenient since you don’t have to attach external speakers to make it work. However, the sound is not very good, you’ll get a better sound by using external speakers. This unit comes with two RCA line outputs so you can connect it to your amplifier, receiver or sound system via auxiliary or line inputs. You will need to use your own RCA cables because they are not included. This player contains a headphone jack output. When headphones are connected, the internal speakers don’t work. Some people have asked if you can connect the Crosley Cruiser to a computer. 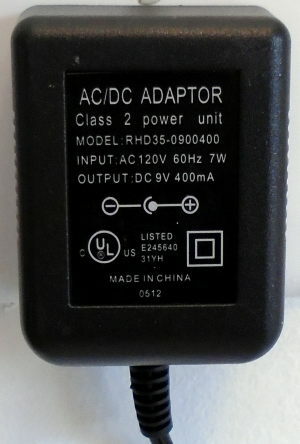 It does not have a USB audio connection but you can connect it to your computer’s sound card using an RCA to 3.5 mm stereo male to male cord. Connect one end to the headphone output and the other end to the sound card. Another option is to use an RCA to stereo 3.5 mm mini-plug cable adapter. You can use your favorite audio editing software like Audacity to digitize your music. Be aware that you won’t get a good sound quality with this player. A practical audio setup for this particular player would be to connect a pair of computer powered speakers to your player. They are way better than the built int speakers of this unit and you can find good prices. You could even buy a good set of pre-owned speakers. You’ll notice a big difference in sound quality. The volume can be adjusted with the volume control knob. This will control the volume level of the internal speakers and headphones but not the RCA line output. When the line out is used you can still listen to the built-in speakers. If you don’k want this, just turn the volume down all the way. Make sure you don’t turn off the turntable. You can connect your portable audio device like iPods and MP3 players to this unit via its 3.5 mm TRS auxiliary input. You will need a cord with two 3.5 mm jack ends which is not included. This feature allows you to listen to your iPod or MP3 player through the built in speakers of the Crosley Cruiser. In my opinion the sound quality of the internal speakers is very bad. The sound is tiny and with no bass which is expected to get from small speakers. The volume is OK for a small room. The sound quality improves a lot when the player is used with external speakers. So, if you decide to buy this cute player, I highly recommend attaching some nice speakers to it. Remember that the condition of your vinyl records also affects sound quality, so always keep them clean and in good condition. 78 rpm records may sound noisy if you use the normal LP needle. I suggest getting a special 3 Mil stylus. You may hear other noises coming from the motor and the power adapter. It may not disturb your listening experience if you use external speakers, but with the built in ones, they are going to be noticeable. Some people are fine with it, I’m not. If you are picky about sound quality, you’ll be disappointed with this turntable. If you don’t care much about that, then you may want to try this player along with some external speakers to get the best possible sound quality out of your Crosley Cruiser. One thing that stands out about the Crosley Cruiser is its nice retro look. It comes in many different colors and designs. It makes a beautiful piece of decoration. If you don’t like its sound quality, at least you’ll be more than satisfied with its cool design. The case is made of MDF fiberboard covered with leatherette fabric. Some parts are hot-glued, which makes me doubt its durability. The top cover has a nice lining on the interior. One thing that I don’t like about the Cruiser, is the lid. It needs to be opened far back in order to avoid 12 inch vinyl records to touch the case while operating. This may be one of the reasons why people complain about speed inconsistencies and wobbling sounds. Make sure to open the top cover far enough to let the record freely rotate. This means that the player will need twice as much room to operate. It is also recommended to sit the lid on the wall so that the turntable is more stable. Always operate the unit on a flat leveled surface for maximum performance. Records up to 12 inches fit on this record player, but remember that there is very little room between the edge of a 33⅓ rpm record and the top lid. The top cover is not removable, this could be a great design improvement because it really gets on the way. When the lid is open at 90 degrees, it measures about 13 inches. 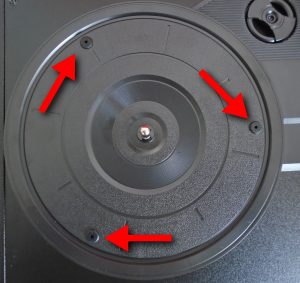 In order to safely play 33⅓ records the top cover must slant back to provide room for the record. You will need about 23 inches front to back. Check all the prices before buying, you may find a cheaper one in a different color. At the time of writing this review the orange one and green are about $20 less! There are opposing views about this product. I have seen many good reviews and many bad reviews. 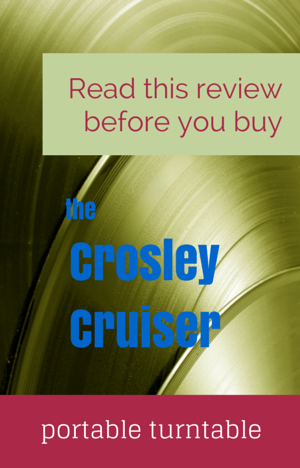 That’s why I think the Crosley Cruiser is one of those products that you either love or hate. The number one thing that consumers appreciate about this product is definitely its design. Many have bought this product because of its cool look. The ease of use and the fact that no extra speakers are needed to make it work is another good reason why consumers like this player. They really appreciate it being plug-and-play. Consumers also love the ability to easily transport this unit everywhere. Many people agree that this portable player is not meant for high fidelity sound enthusiasts. Those that bought this product with that idea in mind were satisfied with the sound quality produced by this player. There is a consensus among consumers that the sound quality greatly improves when the player is connected to external speakers. Perhaps the most annoying issue that has been reported is that the needle skips a lot. I think people consider skipping a much worse situation than sound quality. In fact, people don’t complain when they play music on their tablets with tiny speakers. In most cases the needle skips at the beginning and at the end of the record and many consumers have reported that the skip occurs mainly with newly produced records, including 180 grams. Skipping may be caused by many factors like the condition of the vinyl, the tip radius of the needle, the weight of the tonearm, external vibrations, the volume and the type of music you play. Remember that this turntable has a ceramic cartridge which is more prone to skipping when playing loud, fast paced music with drum like sounds. This unit is also very light, which will cause the whole turntable to vibrate. Excessive vibration may cause skipping, specially if you use the internal speakers at high volume. Try with external speakers or lowering the volume to see if the skipping problem improves. Another solution is the old trick of placing a coin on top of the head. This will add weight and will help the needle remain inside the groove. The downside is that both, your records and the stylus, are going to wear out faster. If your collection is not in mint condition and you don’t care if your records wear out fast, then this is a good solution. But if you have an expensive and fine vinyl collection, I wouldn’t even try to play it on the Cruiser, you’ll end up paying more in the long run, because you would have to replace your damaged records. Somebody suggested replacing the original needle with a metal cantilever one. This may work for you as well. But if you are willing to spend money upgrading the Crosley Cruiser, why not invest a little more on something better from the beginning? For example, for the price of the Crosley Cruiser plus an extra stylus you could get the Audio Technica AT-LP60USB wich is a much better turntable with a higher sound quality. It is automatic and can be connected to your computer. It’s not portable though. The last thing that could help you with skipping and other issues is to always place your turntable on a flat leveled surface. The needle moves with gravity, if the surface is inclined the needle is more likely to skip or skate. The second annoying problem commonly reported is the wobbling sound. People use different descriptions when referring to this type of distorted sound. Imagine your music is constantly speeding up and slowing down, it would cause variations in pitch that sound like a warped vinyl. I remember back in the 80’s, I bought some LPs that had the hole misplaced. It wasn’t exactly on the center. That is something that the eye can’t see. But the result is exactly that warped or wobbling sound. Now, if all your records sound warped, it means that the problem is the turntable. Make sure also that the record is able to spin freely. The top cover may be impeding the record from rotating freely. Make sure you open the lid completely to see if the wobbling sound disappears. Some times the rubber slip mat that comes with this unit may not sit completely flat against the platter. This may also cause the sound to be distorted. You can try leveling it out using auto-adhesive rubber feet as I explained above. If none of these possible solutions work for you, first contact the Crosley’s technical support. If the item is defective, request a replacement from your retailer first. If the returning period has passed, Crosley offers one year limited warranty but you would have to pay shipping and handling costs. They require you to send the item in its original packaging. Other complains from consumers include: units that stop working after a short period of time, defective power cords, tight and faulty headphone plug, inconsistent and inaccurate playing speed, flimsy feel and cheap construction, inability to play 180 gram records and defective units not powering up. Finally, I have seen several complaints about Crosley’s bad customer service. I personally had a good experience with them. They were fast answering my questions but it was only one time. Beautiful, cool and retro design. Click the blue link to download the Crosley Cruiser Instructional Manual. 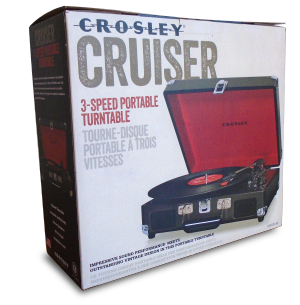 The Crosley Cruiser Portable Record Player is great for introducing kids and teenagers to the vinyl world. Good choice for people needing an easy to use, plug-and-play, self-contained player. Recommended for someone wanting a portable record player at a low price. It’s retro design makes it a nice piece of decoration. Not recommended for serious vinyl collectors or high fidelity audiophiles. Many good and bad reviews can be found on the web. If you decide to buy this product, be aware that several common issues have been reported. The most common ones being the skipping of the needle and the warping sound. I hope you found this review useful. Please live your comments, I love to hear from my readers. Hi I bought my CRUISER DELUXE PORTABLE TURNTABLE / CR8005D in December and I barely bought some records. I’m new to the records scene so i waited long to try it out. I used it two nights in a roll. On the second night I turned it on after I changed the record and the power light just went out. Like no clicks at all when I tried again. What do I do. Its way past the return policy in where i bought it. So I’m not sure what to do. From what you are saying, it looks like your unit is defective. I would contact Crosley Radio even if your return policy is over where you bought the product. Crosley offers one year limited warranty. If you bought your player in December, you are still under warranty. I’m sure they can help you solve your problem. Their phone number is 1.888.276.7539. Thanks for the review, it’s the first one I found not filled with hate. I got a Crosley for my birthday not so long time ago and on the same day I decided to give it a try with some brand new records I recived aswell. The father of my girlfriend commented it looked a little wobbly but in the end everything went well. Some time after I decided to use it with some old records and everything was still really fine until in one record it starts to skip some parts so, as it was old, I thought it was the record itself. I tried with another one and it did the same (actually a little worse) so I tried again with a new one I heard before and, for my surprise, it did the same problem and it gets worse rapidly turning impossible to use it. Anyway, my thoughts were something was not well calibrated so I start my search to try to fix it but, as this brand is so hated, it’s hard to find a serious answer. I know it’s not the highest quality player, but it was a really nice gift and my goal is not to use it every day but more times to times but to have some pleasure when I use it. 1. Will it scratch ruin and my records? 2. What’s the best solution/s to fix this problem? Thanks for the kind comment. Yes, there are a lot of reviews filled with hate. I have even seen youtube videos where Crosley players are being destroyed or burned. I try to be as partial as possible in my reviews. 1. Will it scratch my records? Just make sure the needle and the cartridge are well mounted. My Crosley Cruiser came with the cartridge a little bit twisted from factory, but it was an easy fix. I just carefully disassembled the cartridge and needle and put it back the right way. Just be careful with the connections. I didn’t mess with them. I took a few pictures, let me know if you want to see them. + Clean your records (don’t underestimate the importance of a clean record). + Make sure your record player sits on a flat and leveled surface. + If you use external speakers, place them away from your record player to avoid feedback. + If you use the built-in speakers, start with low volume. Gradually increase volume. Do you get less skipping with low volume? + Make sure the cartridge and stylus are well mounted. Make sure it looks perpendicular to the record. + If this doesn’t work, try replacing the stylus. Maybe it’s worn out. I suggest to get it from LP-GEAR. + If nothing works, you may want to try the old trick of attaching a coin to the head of the record player to make it heavier. Just remember that your records my wear out faster. Skipping may also be cause by external factors. If you have wooden floors, for example, even walking close to the player may cause skipping. Few weeks ago, I was trying the Crosley Collegiate in order to write a review. I had to walk very carefully to avoid skipping. My wife was laughing at me. Hope it helps. If I come up with another solution I’ll update this comment. For me personally, I hated the sound quality of this record player, and I’m 13. This may be because my mom has a very high quality player that she uses, or I just have always appreciated perfect music quality. Either way, I really despised the fact that the Crosley had horrible sound quality, and I asked my mom to return it about 45 seconds into the vinyl I was playing. Thank you for this in depth review, and for listing pros and cons. Thank you for commenting. Your input is greatly appreciated. I would like to now if you ever got another player. i have been reading through the comments and also have noticed with my crosley cruiser turntable that every once in a while the records can warp … more so slowing down then speeding up. doesn’t happen all the time but enough for it to be annoying. i see the possible fix of sticking rubber feet on the platter to try to level out the slip mat. where abouts on the platter do these need to be positioned? or would it even be possible or recommended to take the slip mat out completely in the chance that the record may sit better? the player is still in guarantee from the store i bought it from, would it be better to cut losses with it now and get a comparable product, and if so would this one be any better? I personally don’t like the ION Audio Max LP. It’s certainly better than the Crosley. So yes, I would get that one instead. The ION Audio Max LP has a ceramic cartridge, so it’s still not a very good quality turntable. If your budget permits I would probably get the Sony PS-LX300USB or the Pioneer PL-990. Those two turntables have a magnetic cartridge. They will give you better sound quality and your vinyl records will be safe. They are a little bit more expensive but in the long run it’s worth it. However, I don’t know if you need built-in speakers. The mentioned turtables don’t have built-in speakers. You’ll need external speakers. Hi! Thanks very much for critical review which helped me not to buy Crosley! First read review then went to see turntable in real life. What a great idea of retro design and what a poor quality- everywhere! Everything looks cheap. First look and touch and idea of vintage is gone. Sound quality is not acceptable. I can’t understand person responsible for design or marketing who confirmed speakers. Or it is how people understand old sound and kind of like it? Mobile phones sound better (not perfect sound too). I would pay twice or more for a better quality. Marshall bluetooth speakers are wonderful examples in the same league. For higher price of course. Crosley simply undermines idea of modern retro. The only effective use of it- walk down the street with recognizable suitcase 🙂 i still like the look! I fully agree with B.Radley from 22 April 2015. Thank you very much for your comment. I agree with you Saras. I’m glad you found the review useful. Thank you Keeley, I’m glad the article was helpful to you. I found your review after my own Crosley started skipping, and I just wanted to say THANK YOU for such a level-headed review. I bought a used Crosley because I wanted to dip my toe into vinyl without investing in a whole set-up. It’s hard not to roll my eyes when looking at forums because the second this player is mentioned, all the replies say to toss it out a window. No one even attempts to answer their questions, or if they do it’s just so condescending. Thank you again! Thanks for your comment. I strive to give the best information. Although it’s not always possible, since I don’t know it all and some times budget is an issue as well. I’m glad the article was useful to you. My daughter has recently bought one of these players, purely on the looks and the positive reviews that have been given generally. She has noticed that the speed fluctuates, even between changing records, but more worryingly is that the discs are seriously warping. I noticed that there are 3 studs fixing the turntable and these prevent the disc laying flat and wonder if this, and the very heavy arm are the problem. I have put 4 UK pound coins on the back of the arm to balance the weight and can still play a disc!!!! If anyone has any suggestions of what can be done about this I would be very grateful. My daughter brought this player just for the retro looks and she has the problems already mentioned the worst being inconsistent playback speed, even just by changing the record! The mat doesn’t lay flat on the turntable due to the 3 screws fixing it, and I wonder if this, and the heavy arm are causing all her albums even new ones to warp quite severely. I tried an old one on mine that was five to start, but became warped very quickly. If you have any explanations or suggestions to fix this I would be grateful as it makes the player useless. I’m happy to help you. Sorry it has been 3 days since you posted your comment. You probably figured out how to make your Crosley Cruiser work. Ths Crosley Cruiser should be straight forward to use. 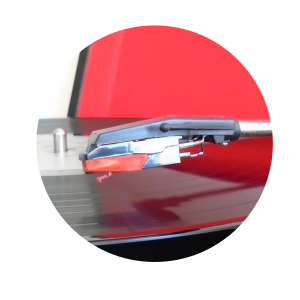 The Crosley Cruiser has a auto-stop switch, when the auto-stop is ON, you need to move the tonearm in order for the platter to start spinning. Try moving the tonearm and place it at the beginning of the record, if that doesn’t work, try turning OFF the auto-stop feature. If you still can’t make it work, make sure that the lid is completely open. 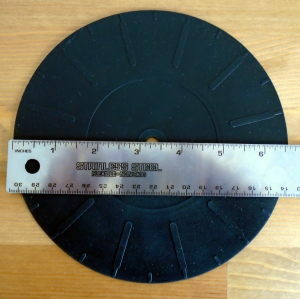 Some times, if the lid is partially closed, it may prevent the vinyl record from sniping due to friction between the lid and the edge of the record. If that doesn’t work, you may have a defective unit. Please let me know if I can help you more. I have 2 Crosley Cruisers. One with the battery option and one from the Record Store Day issue with Micky Mose on it. The first one has always worked perfectly. No skips etc. The RSDay one had a bad external power supply. It did not work out of the box at all. I decided to try the battery powered ones external power supply and now all is good. If you have another power supply that has the same voltage and the plug fits, worth a try. Or call Crosley for a replacement. Thank you very much Gary for the information. I don’t think anyone expects the hi-fidelity experience from tiny speakers, but it would be nice if some of these units at least matched the sound quality of the small speakers found in an iMac or the iPod speakers by Logitech and others, which sounded fantastic for their size. I’m learning that the ceramic cartridge is *also* to blame for why these small speakers can’t deliver any bass, however. Apparently, they’re operating at a high impedence and are improperly amplified, accounting for why people complain that they sound “tiny”. I compared a TechPlay USB turntable and a Crosley Cruiser that I bought for the memories (limited edition Peanuts collectible cruiser model). The Crosley speakers get louder than the TechPlay but they don’t produce the same stereo separation even though both units appear to share the same stylus. The TechPlay is great on allowing you to hear individual instruments within a track but terrible on bass. The Crosley produces more on the low end but the sound stage is very compressed (somewhat muddy). Vocals and low end are decent but the mid-ranges are less distinctive. The TechPlay produces better separation. What I haven’t seen addressed is how the ceramic stylus will impact output to an external set of speakers. My guess is that that type of cartridge will impact the quality of the audio even when connected to better speakers. Now here’s what has me scratching my head: The NP6 Crosley Cruiser-series stylus appears to be identical to what is used by Jensen, TechPlay and other portable turntables. They’re also all diamond tipped, as well they should be. So wouldn’t it figure that if the other manufacturers of portable/USB turntables are using the same stylus their players should be “eating away” at LPs just as much? With respect to the claim that Crosley’s induce faster wear, it’s not clear if a defective stylus is the problem vs. an inherent design flaw (such as the manufacturer intentionally using an overly-heavy tone arm). Rather than take someone else’s word for it, I’d like someone to buy one of these Crosleys and YouTube the result of running a new record over and over again to compare wear on side “A” (Crosley) to some “appropriate” (higher cost gear) on side B (or better yet, use two identical records playing on the same side to make it more “apples to apples”). IMHO, it’s just too easy to parrot claims of overly-worn (damaged) LPs until it becomes a matter of faith. I’d like some evidence, personally, because I don’t see WHY any manufacturer, even for an entry-level product, would intentionally equip it with a lead tone-arm. Is it REALLY a case of 5~6 grams of groove-wearing damage — or was it that QUARTER some idiot attached to the tone arm when it began to skip? Seriously, though, where are the “experts” with their digital scales on YouTunbe showing that these Crosley tone arms amount to lead weights? Prior to purchasing my Crosley I read many an Amazon review where concern for vinyl wear was rehashed (if not implying that some damage had already occurred). But I’d like to know if anybody has THROWN AWAY a record that was completely destroyed by a Crosley that by all counts was in good working order (non-defective). My impression of portable/USB turntables in the entry-level or budget price range is that they’re all using the same stylus, with surprisingly few exceptions. Most suffer from problematic bass reproduction because the cartridges are ceramic and they’re paired to small, under-powered speakers, which only worsens the audio quality. Then, again, most of these units allow for external speaker hookups so it should be possible to arrive at a more satisfactory listening experience in spite of it. Aside from players that skip/skate or are otherwise defective in some way, I’m just not buying the “damage” claims. Still, I am open to the evidence if anyone has any *first-hand experience* that they can trace to the overuse of one particular turntable (Crosley or otherwise). Thanks for your awesome comment. It is true that a lot of low end turntables use the same type of stylus and cartridge. Identical? I don’t think so. Some have a metal cantilever, others plastic, and they are made in different countries. Quality may be different between each one. I’M UP TO THE CHALLENGE!!! I’m going to experiment with a Crosley Cruiser and a vinyl record. I will play it over an over again and measure the wear each time. In about a month I’ll report my findings here and in YouTube. For what it’s worth, I have Adele’s 25 on vinyl, and it wasn’t until I began playing it on a Crosley Cruiser that I began to experience any playback issues. It skips horribly, and on more than one occasion I’ve heard an awful scratching sound mid song, as if the arm were suddenly dragging across the record. The Cruiser has no problems playing older records from my collection (some as old as the 1930s). Either it’s poor workmanship on behalf Crosley, or shoddy production of the new album itself. But it certainly sounds like this record will be fit for the trash bin if I continue to play it on my Crosley (which I don’t. I have a large multipurpose stereo in my bedroom which plays it just fine. Only got the Cruiser so I wouldn’t have to lug that heavy thing up & down the stairs anymore). Sorry to hear that. I’ve been wanting to make an experiment with the Crosley Cruiser to find out if in fact the Crosley Cruisser can damage your vinyl records. I haven’t had the time, though. I see people complainig about it often. That’s on my TODO list. When I do, I’ll post my results. I wonder if you have played your Adele’s 25 on a different turntable before you had the Crosley Cruisser. Why don’t you try on another record player from a friend or your local vinyl record store? Keep us informed and thanks for commenting. Just hooked my Cruiser up to an older receiver and some nice bookshelf speakers. I get a humming when I turn the receiver on, and the sound quality is muffled and awful. Is it my connection…or did I buy the wrong TT. Sorry to hear that! Does your TT work fine with built-in speakers? What inputs are you connecting your player to? Does the receiver make the humming with the turntable unattached? I would like to know the model of your receiver and speakers to be able to help you more. I have also noticed the humming sound. Its already there when you switch it on, and increases when the motor runs. But this is only if you connect the amplifier/receiver to the 3.5mm headphone out connector. There is no hum if you use the RCA connectors at the back. At least that’s my case. Hope it helps! Thank you very much Anindya for providing us with a solution. I got a crosley cr66 Rochester for Christmas and I know this is on the crosley cruiser but from what I’ve seen all crosleys have the same problems. I had ordered some vinyl records a few days before Christmas so for for the first few days I had my 5 in 1 crosley I used it as a speaker system for my phone. By the time I received my vinyls in the mail my mom had thrown away the crosley box it came in. we still might have the receipt. But the arm is just cheap plastic and it’s not heavy enough so it’s skipping my records. And I knew it wasn’t going to be high quality, but I expected it to be better. Found out they damage your records quicker so I decided to look for a new player. I’m looking at the Audio Technica X UO at-Lp 60. My problem is I have looked everywhere for their return policy and how long the return period is. I can’t find anything. Does anyone by chance know how long I can go before they won’t let me return my player? Also does anyone know if the audio technica at-lp60 has an internal speaker system or do I need to buy speakers to go along with it. Sorry if none of that made sense. I’m slightly new to all of this. Thanks – Janey. Were was the turntable bought? If it was at amazon, you have 30 days to return it. However, I think you need the original box. The Audio Technica AT-LP60 does not have internal speakers. So yes, you need to buy a pair of powered or computer speakers to go with it. I received a crosley cruiser for Christmas and for the most part I absolutely love it! besides the quality of the speakers, I don’t really ever seem to have a problem with it, other than when I play one specific record. Most of my records are bought new, whether they’re older artists or new artists, and I always make sure they’re in good shape before I play them. the only problem I seem to have is with my One Direction “FOUR” vinyl, it always seems to sound ‘fuzzy’ or distorted, but only on one or two songs on each side. None of my other records sound like this when I play them. I always make sure my crosley is on a flat surface and the lid is opened enough to allow room for the record to spin freely. My guess it the speakers just aren’t the best quality, but since I really only have the problem with that one vinyl I wonder if maybe it’s the record itself? it just sounds so fuzzy when the vocals get very loud and it’s very annoying because I care about sound quality. Any thoughts on whether or not it’s just the record itself? Do you think it might sound better if I used additional speakers? Thanks for your comment. I would definitely try to hook up the Crosley Cruiser to some external speakers. I’m sure you’ll have a much better listening experience, specially with your One Direction album. As you said, it is possible that the sound level is causing the speakers to sound distorted. Have you tried lowering the volume to see if the distortion or fuzziness improves? unfortunately, the fuzziness only gets worse the lower I turn the volume as weird as that is. it usually only really gets fuzzy when the vocals in the song become high or loud so turning the volume hasn’t seemed to do anything to change it ???? Hi. Had my cruiser nearly a year now and absolutely love it . One or two vinyl skip but mainly older picture discs and new prodigy album( as per your review of heavy dance beats! Recently I had a lot of trouble trying to remove the needle to replace it. Ended up using tweezers to force the needle off out it pulled half of the underside of the front of the arm with it. It was still attached to the wires at the back of the arm but after fixing it back in place with the replacement (Crosley NP6) needle the vinyl sounds quiet and scratchy . Do you think I have damaged something where it came off . I’m sorry to hear that. From what you are saying, my guess is that something got damaged as you said. One possibility is that the cables are not connected properly. Another possibility is that the needle is not sitting properly inside the cartridge’s ceramic rod. But most likely, the cartridge is not aligned properly. The Crosley Cruiser has a cartridge fixed to the tone arm, it comes aligned from factory. It’s going to be a challenge to manually align it since the tonearm is not adjustable. My advice for you is to try to align the cartridge in such a way that the stylus is tracking perpendicular(vertical) to the record and tangent to the record grooves. I hope you can fix your issue. If you need anything else, feel free to comment again. Thanks Francisco for your prompt reply and assistance . I have removed the cartridge again , removed and reconnected the three cables. The scratchy sound has gone but no sound (apart from the tinny sound as if earphones were plugged in). 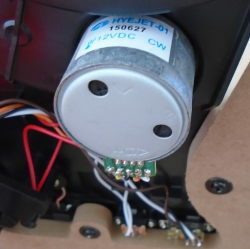 When you touch the wire connectors there is a hum noise , this is with the volume halfway also a hum noise when you touch the tone arm . Sorry to hear that! I wish I could help you more. My advice to you is to contact Crosley Radio, they may be able to help you. Thanks but that’s not an option when you access the site. They do not take emails . Instead they just direct you to your nearest stockist via a map and those retailers do not stock Crosley and therefore you get nowhere. I will take the majority of other people’s advice and never buy another Crosley . Thanks for your assistance Francisco . Hi, I’m very new to vinyl and I want to look into all my options before buying. I have about a 70-115$ range and I’m looking towards buying se newly released records. Would the cruiser be good to start with? I was looking at the crosley executive turntable but I’d like some advice first. It really depends on your needs. I personally don’t like the Crosley Cruiser. For the same price you can get a better turntable. I like the look of the Crosley Executive, it’s portable and has built in speakers. If you don’t care about the portability, I would get the Audio Technica AT-LP60 for about the same price. It’s a better quality turntable with a magnetic cartridge that will give you a much better listening experience. The downside is that you would have to already have some powered speakers or a sound system to connect it to. If you don’t already have them, you would need to buy a pair of powered speakers. Although the Crosley Executive has built-in speakers they don’t sound very good and you’ll probably end up hooking up your player to external speakers anyway. Hi, I just got a new Crosley CR8005U cruiser for my birthday. I live abroad so I had to use an adaptor. When we tried to turn it on it wouldn’t turn on. I think it’s a voltage issue because I live abroad but I don’t know? Yes Ceili, you are right, it is a voltage issue. 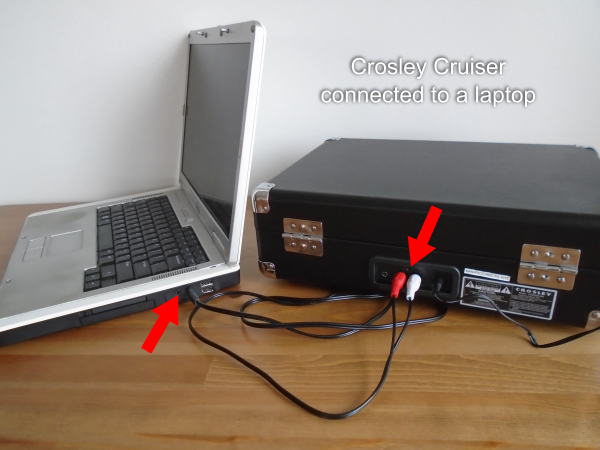 The Crosley Cruiser is designed to work on a 110V current. If you live on a place where 220V is the norm you need to get a power transformer. However, it won’t work perfectly because the frequency of rotation may change, meaning that your player may play the music at a different speed and pitch. I’ve been bought this record player for my birthday. I’m having some trouble with skipping as it seems is a common problem. I’m not very technical and have a question about replacing the needle to the metal one (793-D7M). 1. Will replacing the needle mean that my records won’t be worn down as much? Yes, it is a common problem. Have you tried leveling your record player with a spirit level? 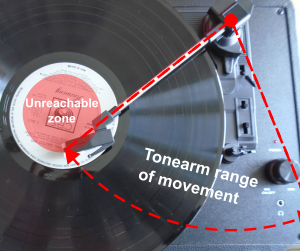 Your record player should be completely horizontal to avoid skipping. Some people have reported that the skipping improves when they replace the needle to the metal one. It’s hard to tell weather the needle with metal cantilever will be easier on your records. I think that the problem is more the weight of the tone arm. I’m wanting to perform an experiment with a Crosley Cruiser with different needles. If I find the time to do it, I’ll post the video for you to see. Just out of interest how much will the use of the crosley affect the longevity of my records? So, after reading this very helpful review. Is there a vynil recorx player you DO recomend? Thanks for your question. My philosophy is that any product has its market. Meaning that it really depends on what you are looking for. If you need a cute little player and its tiny sound doesn’t bother you, then Crosley Cruiser may very well fit your needs. However, if you are picky about sound quality, is better to go for a better turntable. So, the record player that I recommend depends on each person’s needs. If you give me more information about what you are looking for, I can certainly help you find the best product for you based on your needs and your budget. But I don’t want to leave the question unanswered. So, assuming you were interested on the Crosley Cruiser or something around the same price. My recommendation would be the Audio Technica AT-LP60. But again, if you need built-in speakers and portability is important to you, forget about the AT-LP60. Having used my father’s Dual 505 turntable while growing up and getting it repaired several times, I decided it was time to buy a new turntable because once again the sound keeps lagging. Another reason for buying a new one is because I’m heading off to college in September and thus I’d like to have a turntable of my own. Taking in consideration the fact that I’ll be moving to a different country, I would like to purchase a portable turntable. Of course, my first thought was buying one by Crosley but after reading several reviews (including this one, thank you! ), I got very discouraged. Can you please recommend some portable turntables, if you have any in mind? Electrical appliance wipe to remove some of excess…but it is still in the middle of the player. Please respond…. Thank you ! I would also encourage you to contact Crosley Radio, they may be able to better answer the question. Here is their contact information. I’ve come across your review because I received a Crosley Cruiser for christmas this year. Before even opening it, I hit the internet and started to dig into reviews while simultaneously looking for my first vinyl purchase. With everything I’ve read between Amazon and standalone sites on this “cute” player, I’m extremely worried about it. I’m new to vinyl, as it’s always been one of those things my family couldn’t really afford to keep up with. Now, at the age of 32, I’m finally in a position where I can start this hobby and I would like to do so with a decent setup for a decent price. At the moment, I’m looking for a player in the range of $50-$85, to allow myself some extra cash for a couple albums. I’ve done some searching, and was curious what you thought about the Jensen JTA-230. Would you recommend it over the Crosley? Also, I’m totally opened to use players, do you see anything on the bay that may fit my fancy? My personal needs are pretty basic. A good player that won’t have issues with speed/skipping is my main concern. I don’t need AUX in, as I have plenty of other devices dedicated to my MP3 players/etc. I don’t need a player that can connect to a computer, as I won’t transfer music. I would like a player that has a built in amp, as I don’t want to buy a standalone amplifier, but I guess if I found one for an extremely good price and could make both work in my budget it would be fine. Speaker wise I have some computer speakers I will use for the time being until I can upgrade them here in a couple months. Your help and advice is much appreciated, and I look forward to perusing your site while I wait for a response! It’s great news that you received a record player for Christmas! The Crosley Cruiser is not a good player, I wonder if you are thinking about changing it to something else. In my opinion, the JTA-230 is a better choice than the Crosley Cruiser. Plus, it has generally a lower price. But if you are really thinking about to start collecting vinyl as a hobby, I would encourage you to get a vintage turntable. For the same price you can usually get a much better player. I would search for vintage record player on eBay or look for a local record store where they can sell you a preowned turntable. I would hookup the player to your computer speakers until you can get a better setup. You can also visit my section on vintage turntables and read Anthony’s article. Thanks for your comment and I hope I could help. Hey Francisco, great review! Real quick ideation. Do you know of a lot of complaints that the sound is warped through the Crosley Cruiser? Purchased two separate ones for Christmas and both are making brand new records sound very warped. If so, any recommendations for fixes? Thanks for posting. I’m glad you liked the review. Yes, the warping sound is a common complain. It is expected from a low end turntable. Some people notice it more than others, I don’t know how bad yours is. I wonder if your records are 180 or 200 grams? Make sure you open the lid all the way, because of the design, an LP doesn’t fit well wen the lid is partially open (say at 90 degrees). The LP touches the lid wall barely causing some friction. 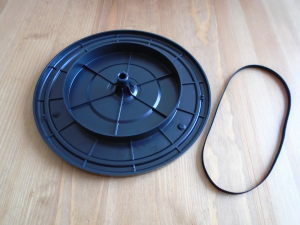 You may also try replacing the belt, with a better quality one that you may get from lpgear.com (I personally would’t spend money trying to improve the Crosley Cruiser, it’s just not worth it). Other than that, I would say you would have to live with the issue or get a better player. But as I said, I don’t know how bad the warping sounds on your player. I’m also curious about the records you were playing. You may try to play your records on a better turntable to see if they play OK.
hi! I just got the tan/ leather version of the crosley cruiser and in the left speaker it has so much static and its so hard to listen to I cant stand it. Its only when I have a record playing. if I just have my phone playing on the AUX, it sounds fine. Its so frustrating and I have no clue how to fix it.Please help me out! Probably the cartridge or stylus is faulty. That is not a normal behavior. Make sure the needle is well placed. If it doesn’t work contact Crosley Radio Support. I got this for an early Christmas present but it makes a high pitched noise when I put the needle on the first song. Also the LP moves in an odd wavy way and I am not sure why. is it because of the small black thing below it or something else? I hope someone might be able to answer by questions and, in advance, thank you. It is certainly a odd behaviour. Mine doesn’t have that problem. Make sure the belt is intalled correctly. That may be the problem. If not, your unit may be faulty. Contact the seller or manufacturer. If you give me more details, I may be able to help you. Sorry to hear that. Are your Vinyl Records new, or used? Are they in good condition? 1. Play your vinyl record on a better turntable to see if it skips. Just to make sure that your LP is not to blame. 2. Make sure your Crosley Cruiser is sitting on a flat surface. Use a level spirit to make sure the surface is completely horizontal. Don’t underestimate the importance of this. Having your turntable perfectly leveled may solve your issue. 3. Experiment with different volumes. If you are using the builtin speakers, it’s likely that the music itself is causing the skipping. If the music is too loud or with sudden amplitude changes like drum-like and bass sounds, they may cause the skipping. You can always connect your Cruiser to external speakers and have them as far away from the player as possible. 4. The needle that comes with the Crosley Cruiser has a plastic cantilever. Some people have reported to solve their skipping issues by changing the needle for one with a metal cantilever. Search for 793-D7M on eBay or amazon . 5. Your last resource is to tape a small coin. Just be aware that it may wear out your vinyl records faster. I hope it helps. Keep me posted. I bought the chalk board version of the crosley cruiser, and so far have not had any problems at all with it. I would even say that I like the little thing. For the price, it has served its purpose. However, I play my records very often, and am concerned that it is going to cause unnecessary ware on them, especially my brand new ones. Do you think that this is a real problem? I would like my collection to last long into the future, and if this record player is going to keep this from happening, then I would be interested in buying a new one. Thank you. Thanks for your comment. I’m glad your liking your Crosley Cruiser so far. There are different opinions about this cute portable record player. It is one of those products that people either hate or love. In my opinion, any record player with a ceramic cartridge may wear out your vinyl records because they tend to have a heavy tracking. It really depends on how often you’ll play your records. Another important thing to consider and that many people don’t take into consideration is how clean you maintain your records. Many times, the dust and other contaminants may also cause wear on the vinyl. You may consider having a brush and a cleaning system to avoid unnecessary wear. If you have new albums or expensive ones, I would definitely get a better turntable. On the other hand, if you have an old collection, or if you like hunting for old records on garage sales and stuff, then your little cruiser may be just fine for your needs. Hi thanks for the review. 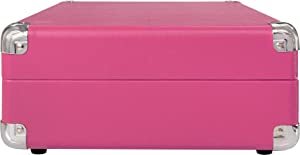 This record player is for my 14 year old so Im sure will be fine but can you recommend a set of speakers (because I’m not technically minded) that I can buy for them please? Thanks for your comment. I would buy the Logitech Speaker System Z323 . Yes you can play music from your iPhone if you connected to the aux in port. But let me warn you that the built in speakers of the Crosley Cruiser are small and don’t sound very. I would probably get better speakers. But again, yes you can connect your iPod via the aux in port. Based on your advice, I wouldn’t buy Crosley Cruiser. 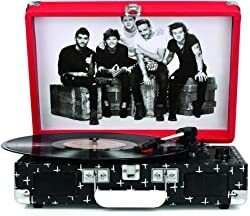 Is there a good quality portable record player that one could consider in stead of Crosley? 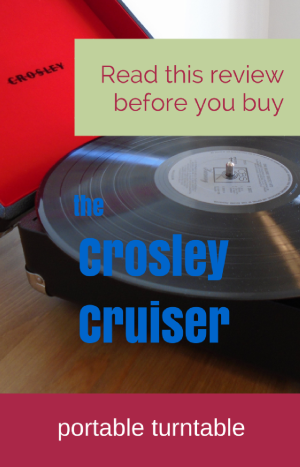 Y personally wouldn’t buy a Crosley Cruiser, but it really depends on your specific needs. Most portable turntables are about the same quality. Because of their price, they generally come with a ceramic cartridge and poor quality construction and materials. Many people buy the Crosley Cruiser because it looks nice and is very small and light weight. People who like the Crosley Cruisery don’t usually care much about sound quality. A better option may be the Electrohome Archer, but the drawback is that it doesn’t have connections for external speakers. The Crosley Cruiser does have RCA outputs. Better portable record players tend to be much more expensive than the Crosley Cruiser. I would look for players that have a magnetic cartridge and that include output connections for external speakers. The ones I know from Crosley are: Dansette Jr, Keepsake Deluxe and Nomad. I like the Keepsake Deluxe because it has many features that other portable record player don’t have including the USB port for PC connection, arm weight and tone control. But again, is far more expensive than the Crosley Cruiser. Another option for you would be to buy a vintage portable record player. Some times you can find good quality used players in good condition, but the search can be time consuming. If you give me more information about your needs, I’m sure I can work with you to find the best product to suit your needs. How does this compare to the CR49 in terms of sound? My 22 year old grandson asked for the CR49 for Christmas. After reading your review, I am hesitant. The Crosley Traveler CR49 is better in terms of sound quality than the Crosley Cruiser. The speakers are bigger and so is the body which helps reproduce sounds better. Plus, the CR49 has a tone control knob. However, the Crosley Traveler doesn’t have output RCA connections or a headphone jack. So, you won’t be able to connect your traveler to external speakers. This is, in my opinion a big disadvantage. 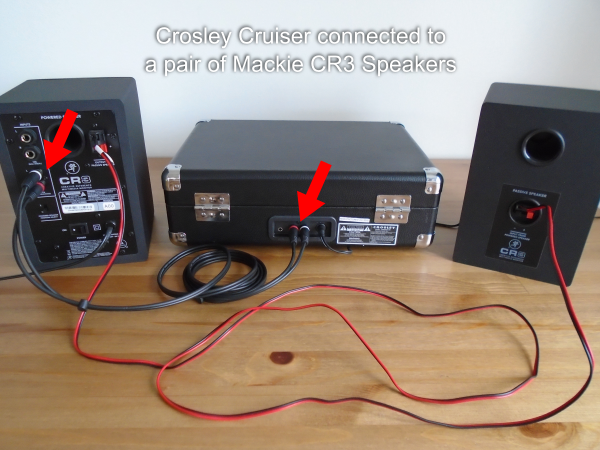 The builtin speakers of the Crosley Cruiser aren’t loud enough and the sound quality is not very good but it has RCA outputs, so you can always attach external speakers for better sound quality. The Crosley CR49 doesn’t have an auxiliary input either, which means that you won’t be able to play your portable devices through the Crosley Traveler’s builtin speakers. If your son is looking to get a Crosley Traveler CR49 for Christmas, I would encourage him to consider the Crosley Keepsake. For about $30 more, you get more features that are worth the price difference. The Crosley Keepsake has a headphone jack, RCA outputs, axuiliary input and a USB connection for digitizing your music. So you have better builtin speakers than the Crosley Cruiser, but you also have the ability to attach external speakers or connect the turntable to your computer. Hi I wanted to change the needle on my Crosley Turntable I’m very savy when it comes to electrical work and soldering so I’ve actually switched out the motor for better speed and now I’m working on sound. I’m not sure if my turntable uses the np 6 or np 1 but I wanted to install a 793-D7M. Since I’ve never switched out the needle my question is will it fit right on or will I need to adjust it for fitting. Thank you for your comment. The Crosley Cruiser uses the NP6 needle. This is a very common needle, many turntable brands and models use it. The 793-D7M needle will fit right on, no need to adjust for fitting. Can you share with us your experience with your Crosley Cruiser so far? I’m curious about your name, it sounds like you may speak Spanish. I’m Mexican but I live in Canada. I bought this record player and several new records and one of them skipped. I haven’t used it in a while but now when i turn it on it will power on long enough to illuminate the power light but then quickly powers off. I opened it up to see if any cables had come loose but didnt notice anything. I did notice the crappy hot glue job. This thing was very expensive and the speakers are horrendous. I have owned a $20 cell phone that had better speakers so this is unacceptable. The crap speakers were expected but I did not expect the power supply to spontaneously fail. I do like vinyl but i am not a fanatic. Id just lole to be able to have a reliable player that i can hook some speakers up to. Can you recommend a decent used/vintage player under $100, including any necessary accessories? People often ask me to recommend used/vintage record players. I’m even thinking about having a new section of my site for just vintage turntables. It’s a little bit time consuming because it requires you to constantly search for what it available. Let me tell you that I think that getting a vintage player is a wise decision because for the price of a Crosley Cruiser you can get a much better used player. I don’t know where you live, but a good place to start would be a local record store. If you prefer to buy online, I would check out eBay. I’ll do a quick search for you, but by the time you read this, you may not find the items. This one caught my attention. I hope you read this soon, because the auction will end in about 2 days. It’s an auction so the price may go up, but right now there are no bidders. Pioneer PL-L50 Direct-Drive Fully-Automatic Turntable System Linear Tracking. Just an update to make my point. This record player, far better than a Crosley Cruiser, was sold for $34 dollars!!! I’ll definitely add a Vintage Rercord Players section to my website. I’ll keep looking for options for you. I’ll come back and probably have a new section on used turntables. Do you have any recommendations for external speakers? I received the Cruiser as a gift when I started my vinyl collection, but now I’m frustrated with the poor sound / quality of it, but am not currently in the position to be able to buy a new set up. Anything that would help would be great. Thank you! Yes, unfortunately the sound quality of the built in speakers is toy like. But it can really improve with external speakers. You can use any of the speakers that I suggest in my article Powered Speakers for Audio Technica AT-LP60 and AT-LP120 Turntables. If you are on a tight budget, go for the Logitec Z323. If you need something cheaper, then any computer speaker will do, but the sound quality won’t be as good. Just remember that you’ll need to buy RCA cables. Can someone help me? I purchased a crosley portable record Player for my child, and the motor runs to fast, the 33,45 & 78 make the record sound like chimp junks, not ideal for Taylor Swift. We have the correct adapter and step down transformer, however makes no difference when playing the record. It is as if the motor on 45rpm is out of sync to the record purchased in Australia…I have no idea, any suggestions would be great. 1. The voltage converter doesn’t change frequency, this may in fact affect the rotation speed of your turntable. In the US the voltage is AC 120 V with a frequency of 60 Hz. If I’m not mistaken, the electrical power in Australia is 230 V with a frequency of 50 Hz. Even though you have a power adapter, the frequency doesn’t change. 2. The second possibility is that your product is defective. I think the vinyl record itself has nothing to do with your issues since the format should be the same as in the US. 1. 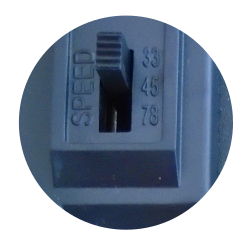 It looks like you can adjust the motor speed but you would need to open up the unit. This is done with a small screw driver. I just don’t know if this would void the warranty. 2. My recommendation to you, before you try to fix it your self, is to contact the manufacturer, they’ll help you fix your issue or they may send you a replacement if the product is deffective. Here is their contact information. Good luck with fixing your player and please keep us posted. I just want to know can the lid be easily removed as I do not want to play records with the lid open? No, it cannot be easily removed because the hinges have rivets. Yes Francisco, you are the best!! It Is great the job that you are doing in this web :). Congratulations!!! Thanks Estela, I’m glad you like it. You are correct that you can get a 3 mil. 78rpm stylus for this player. Although Crosley does have a few different models of actual turntables, this is the most common one seen in many different styles of Crosley and many other manufacturers’ record players going back to the 1980s. It makes me wonder if Crosley doesn’t want any third-party styluses being used in their turntable…and if what you say is true, that their styluses are 1 mil., well, that really bugs me. I’ll explain why in a sec. Yes, I have a true 3 mil. stylus that I purchased on ebay. I don’t remember a reference number but they’re not hard to find. I have a Memorex 3-speed turntable with this exact make of turntable in it. It’s a component that has no built-in speakers. I ONLY use it for 78 rpm shellac records. It makes sense (to me) because compared to an old clunky wind-up gramophones and even early electric record players with heavy tonearms, there is an advantage to using these because they’re so much lighter…just gliding through those old grooves instead of grinding through (with the correct stylus!). Now, this is very different when it comes to vinyl…and old styrene from the 1950s-80s. Never forget about styrene and being safe with it because it’s so delicate…Vinyl is tougher that shellac, but the wrong needle or worn needle can really do some damage…eat at the groves By design, these are really ROUGH players…just like the old Fisher-Price players (garbage) that are so popular on ebay right now…only made to throw some sound back at you with no consideration for design or standards (sound quality or gentleness to records). They’re just a cheap, pretty product to throw at people who don’t know any better. They’re wobbly, shaky, speed is inconsistent, and if you don’t output the sound to a better playback source or if you’re just stuck with no outputs on the unit, you’re really in trouble when it comes to the horrible and un-listenable sound qualty. Even still, it’s not that great when you do output the sound. I’ve owned a stand alone unit made by Crosley with no outputs. I threw it in the trash because they’re not even worth reselling. I would NEVER play vinyl (or styrene) on one of these, newer condition or old beater 45s. I can just hear it eating at the grooves. Which brings me to the stylus. I’ve never heard of it being a 1 mil. stylus. If that’s so, that’s even more of a reason to never play vinyl on them. That’s just asking for groove damage to microgrooves and horrible playback from 78s (and reaching deeper in those old shellac grooves and cutting into them making the ever-present hiss even worse than it is naturally). They have three speeds. Provide the correct stylus instead of leaving people who don’t know any better in the dark. Anyway, to sum things up, Crosley has done a great disservice to this new surge of interest in vinyl. They may have helped with bringing back the interest by providing the means cheaply, but the products they’re providing is ruining the sound and the media the sound is coming from. If you need to go cheap, do yourself (or the person you’re giving a gift to) a favor. Spend around the same amount of money on a new basic Pioneer, Audio Technica, or Sony turntable. While they’re not “High-End”, they provide great sound quality, I assume through the magnetic cartridge (great sound all across the sound spectrum), and have a much lighter tonearm that won’t rough up the grooves…at least not without decades of play time on them. Leave these Crosleys (and other brands) to 78s only or pass them up all together. Thank you very much for sharing your knowledge with us. First let me apologize because I just realized I had some errors. I wrote 0.3 Mils for the 78 stylus tip radius instead of 3 Mil. I’ll check my other posts to make sure I didn’t make the same mistake. You are right, the Crosley Cruiser is very popular. I’m not sure if it’s because of the price or its retro look. In fact, I saw the other day a home decoration website recomending the Crosley Cruiser for a nice home touch. They had very nice pictures. To me the Crosley Cruiser is expensive for what you get. There are better options for the same price. As you said Pioneer, Audio Technica and Sony are trusted brands. I think people on a budget should consider buying a pre-owned turntable. I’m sure you can get a better quality pre-owned turntable for the same price. I know people like to buy new stuff, I do to, but people needing a cheap turntable should seriously consider this option. As for the 1 Mil stylus, I wish I could actually measure it. It would be an interesting project. Buying a Crosley Cruiser and put the needle under the microscope. I’ll try that when I save some money. Thanks for your comments. You made me laugh! 🙂 Look, I always try to see the positive side of things. So I guess I was trying to find something positive about this turntable. If I were on a budget, I would probably buy a better pre owned turntable instead of a Crosley Cruiser, but I still see many people buying them. Any way, thanks again for your comment. Hi! Thank you very much for this review! My english is not so good, so I did not understand a thing: on my Crosley Cruiser, sometimes, the needle skips on new 45/33 vinyls. Have I to change the needle to fix it? I hope you have the time to answer me. Hello Marco. What is your native language? I speak Spanish if that could help. Skipping is a common problem found on the Crosley Cruiser. There are many factors involved. This is a very light unit and can vibrate a lot with its internal speakers and external sources. People report skipping mainly with new 45/33 vinyls. This is something I need to research more. But my guess is that in order to fit more music they make the grooves closer together or narrower. As I said, I need to research a little more about why that happens. 1. First I would make sure your player sits on a flat and leveled surface. 2. Make sure the lid is open far enough to avoid the top cover to touch the vinyl. 3. Keep the volume low or use external speakers. 4. Keep external speakers away from your player to avoid resonant vibrations. 5. If none of this improves the skipping. Try a needle with a metal cantilever. 6. Your last resource is to tape a coin on top of the head to make it heavier. Just remember that this may damage or wear out your records and the needle faster. I hope this helps Marco. Can you give me a link or the name of a needle with a metal cantilever that fit on the Crosley Cruiser? This type of needle fits many models. Please keep me posted. I want to know if this solves your issue.